3.8 out of 5 based on 44 bloggers and 2 commenters. 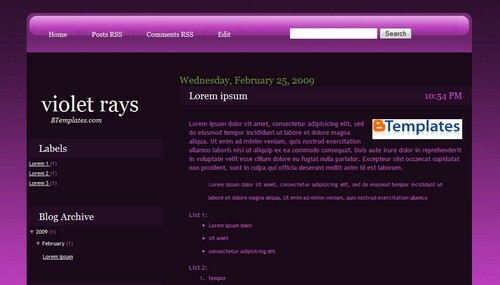 Violet Rays is a free blogger template with 2 columns, left sidebar, rounded corners and neutral colors. Probe tu templare y me di cuenta que tiene una falla en Internet Explorer, no sabes como soluciona ese error? hi, i really like this template and i was wondering .. i have reactions and other things on my blog tht isnt on the preview. The font color for them is black. Can you help me change it to a lighter color like white so that they can be visible. If you need a look at what im talking about go to my blog and look at the reactions under each posts. I would really appreciate it.